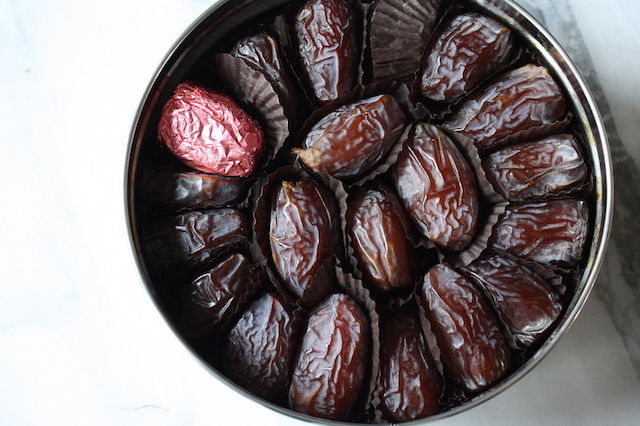 I’m drowning in dates right now and not the good kind of dates a girl would like to be drowning in. Actual dates. Dried fruits. With pits. To start, there was nearly a pound sitting on my kitchen table, leftover from a project I finished just before the holidays. Before I’d even had a chance to register their presence, I got the email from my friend Michele that appears in my inbox every January. “Hi. Got the dates. Want them?” You see, every year her financial advisor sends her, and her mother, a tin of dates from California as a holiday present. She does not know why dates. Neither she, nor her mother, like dates. However she, and her mother, do not want to hurt the guy’s feelings so they don’t tell him and every year, the dates arrive. And I get an email and a subsequent delivery of said dates. Two two-pound tins. Every year. It’s a lot of dates. The thing is, I like dates but nearly 5 pounds is a damn lot so lately I’ve been throwing them in everything. One or two in my morning smoothie for sweetness and fiber. Two or three went into a Moroccan style lamb shank I was braising the other night. I make a salad, in go the dates. For New Year’s I stuffed a bunch with cheese and wrapped them in bacon. That last one used up a bunch but at this rate I won’t be anywhere near finished before next year’s delivery. I needed to get on it. 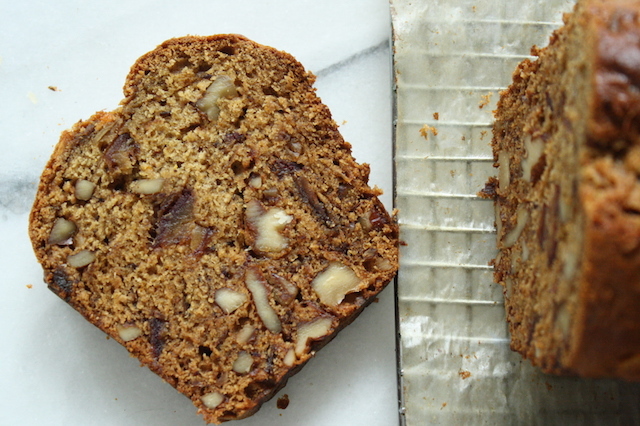 So I came up with a recipe for Date Nut Bread. Delicious right? I couldn’t even tell you the last time I’d had it. I distinctly remember a few tea sandwiches, spread with cream cheese, at a Marshall Field’s department store when I was younger. Marshall Field’s no longer exists so that should give you an idea of how long it’s been. Date Nut Bread, here I come. It’s a pretty simple recipe, made in one bowl with a rubber spatula. No fancy equipment needed. There’s lovely flavor – the dates get a good soak in earl grey tea then are combined with a little orange zest, vanilla and of course, bourbon. A full cup of chopped walnuts are folded into the finished batter for a great crunch. The bread is rich, moist and surprisingly dark, both in color and flavor, without any additional spices or molasses. 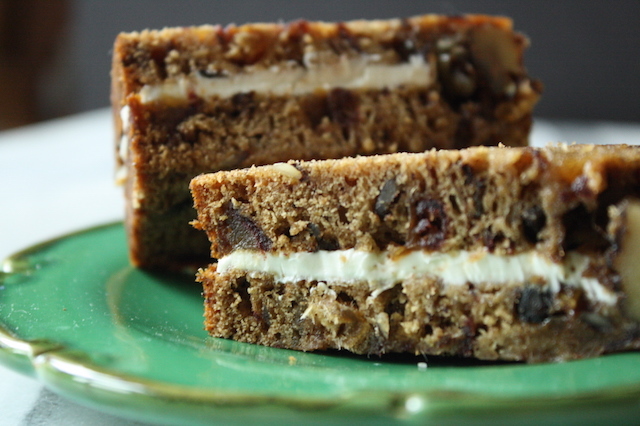 It’s really very tasty and is great with butter and better with cream cheese. And the crust? A little crunchy, a little sugary; it is fantastic. Oh, and the best part? 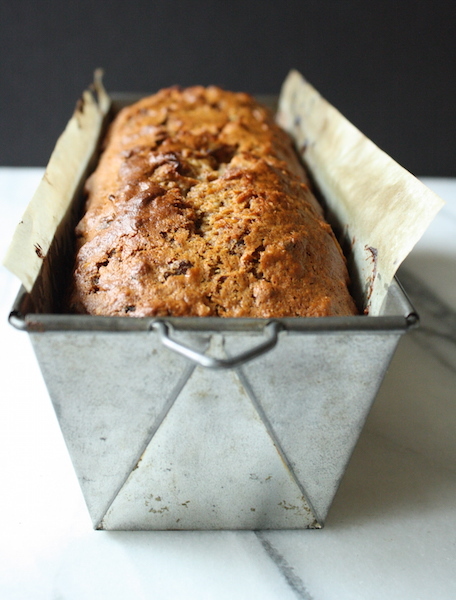 This loaf uses up nearly a pound of dates. Hooray! Four more loaves and I’m done. It’s entirely possible. STRESS THERAPY BAKING FACTOR: MIGHTY NICE. This is just plain ‘ol good. There’s nothing overly fancy or complicated about it and its unique because no one seems to make it anymore. Everything old is new again, I suppose. 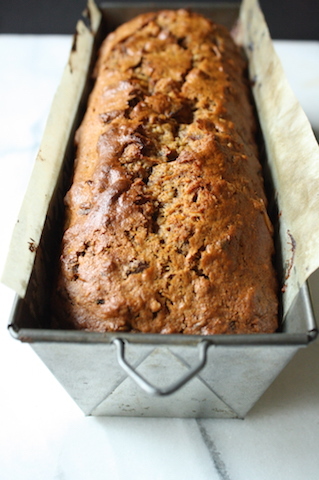 This recipe makes me want to come up with a recipe for zucchini bread and another for cranberry bread and do a little tiered tea sandwich/quick bread sampler with sweet little pots of tea and nosegays for everyone. And did I mention this used almost a pound of my dates? Preheat the oven to 350°F. Lightly grease an 8 ½”x 4 ½” loaf pan. Place the chopped dates, butter, baking soda, salt, and brown sugar in a mixing bowl. Pour the hot tea into the bowl, stirring to combine. Allow the mixture to steep for 15 minutes. Once cooled, add the egg, orange zest, vanilla, bourbon, and then the flour and baking powder, beating gently with a wooden spoon until smooth. Pour the batter into the prepared pan, gently tapping the pan on the counter to settle the batter. Bake the bread for 60-65 minutes, tenting the loaf gently with foil after 30 minutes, to prevent over-browning. Remove the bread from the oven; a cake tester or toothpick inserted into the center should come out clean, and an instant-read thermometer should read about 200°F. After 10 minutes, gently turn the bread out of the pan onto a rack to cool. Cool completely before slicing. Wrap airtight, and store at room temperature for several days; freeze for longer storage.